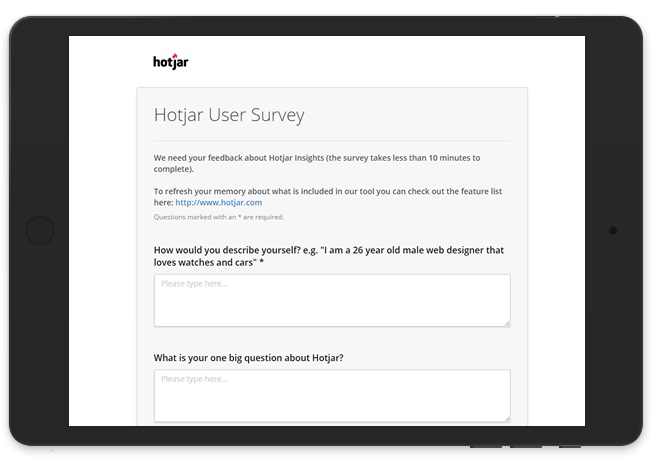 Hotjar is a new, powerful tool that reveals the online behavior and voice of your users. By combining both Analysis and Feedback tools, Hotjar gives you the ‘big picture’ of how to improve your site's user experience and performance/conversion rates. The Analysis tools allow you to measure and observe user behavior, see what users do, while the Feedback tools allow you to hear what your users have to say, the Voice of User. Understand what users want, care about and do on your site by visually representing their clicks, taps and scrolling behavior - which are the strongest indicators of visitor motivation and desire. Eliminate guesswork with Recordings of real visitor behavior on your site. By seeing your visitor's clicks, taps, mouse movements you can identify usability issues on the ﬂy. Improve online form completion rates by discovering which fields take too long to ﬁll, which are left blank, and why your visitors abandon your form and page. Improving the performance and experience of your website starts with understanding what your visitors want and what's preventing them from achieving it. Target questions to specific visitors anywhere on your web and mobile site. Build your own responsive surveys using an easy editor. Collect responses in real-time from any device. Distribute your surveys using web links, emails or invite your visitors just before they abandon your site to uncover their objections or concerns. Our incoming feedback feature allows you to get instant visual feedback for your website or app. It allows you to see what people love and hate, identify issues, and find opportunities for growth. Recruit the best possible participants for user research and testing directly from your site. Collect profiling information, contact details and offer a gift in exchange for their help.